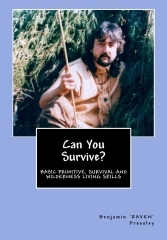 Raven’s most comprehensive book of Primitive, Survival & Wilderness Living Skills. Fully illustrated with instructional line drawings and great photographs. 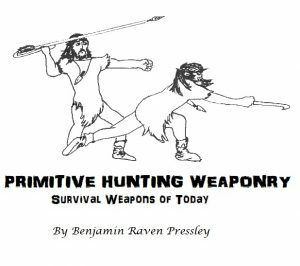 Covers: Shelter, Bow & Drill Firemaking, Flint & Steel Firemaking, Hide Tanning, Acquiring Safe Drinking Water, Primitive Hunting Weapons, Traps & Snares, Direction Finding, Edible & Medicinal Plants, What Animals May Be Eaten, Survival Kits and much more! Also available in paperback for $15.95 + shipping. This little book will teach you a lot about fire making. It discusses several techniques as well as finding wood, tinder and much more. As a bonus there is also a how-to on making cordage from plant fibers in the wild. This could be a life saving skill. You never know when you will need string for making a bow string, making fire, binding a wound, setting a trap or snare. This just may be the most detailed book on flint and steel firemaking out! 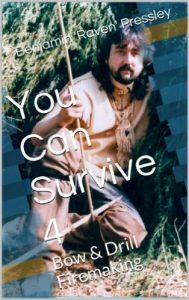 It gives a historical perspective and describes how it is still a viable way to make fire in a survival situation. Buying the right fire steel, selecting tinder, making char cloth, how to light a candle with flint and steel and more! Great for re-enactors or any student of history or survival. 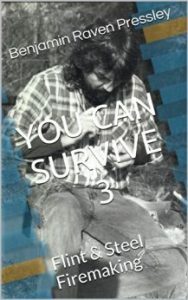 This may be the most detailed and comprehensive book on the market on the subject of bow and drill fire making. It discusses different bows, strings, sockets, wood choices, body position, cutting the notch just right and much more. Nothing can replace hands-on teaching but I have had letters from people who said the instructions in this book were so thorough that they were able to make their first fire by merely following the instructions in this book. 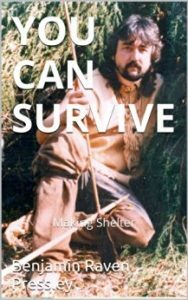 In th is book you will find how to build life saving survival emergency shelters of many kind. Field tested by Raven himself. 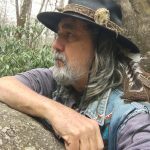 Let Raven teach you to build a wickiup, lean-to, debris shelter, ground bed, coal bed and more! Learn about how to insulate your body to retain heat using the proper shelter. Some shelters do not even require a fire to stay perfectly warm! You can only go without water 4 days. Where do you get clean, safe water in a survival situation? What are the essentials for food gathering? What animals can be eaten? To eat meat in a survival situation traps and snares are still a viable solution. Some of Raven’s tried and true go to traps and snares are described in this book. 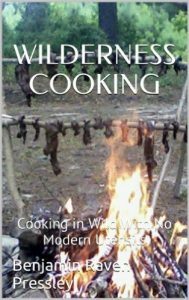 This is the most comprehensive book on cooking in the wild with no modern utensils. Great for survival or just lightening that backpack. You won’t believe all the ways you can cook without a single pot or pan! This is a very comprehensive book that describes braintanning mammals of all sizes, hair on or hair off. 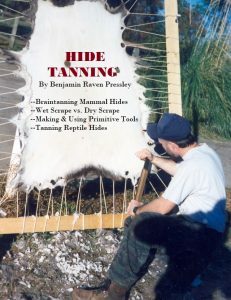 This method of tanning was done by primitive people all over the world and is still the most economical way to tan mammal hides and can be done in a survival situation. It describes how to do dry scrape, wet scrape and even the Northwestern Native American method of smoking a hide before braining it. This book goes into great detail on describing how to make the tools you will need including a description of making and using primitive tools. Tanning reptile hides and even bark tanning is described. Long before the bow and arrow ice age hunters were hunting Mastodons with weapons like the atlatl and small game with throwing sticks. Our ancestors hunted with bola, sling and more. These weapons are still very viable weapons for survival and can be constructed in the field with very few tools. This book goes into detail on how to construct and use all the weapons described. How did ancient people fish for thousands of years? 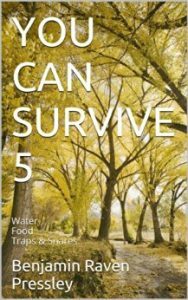 Can I apply these techniques to survival today? 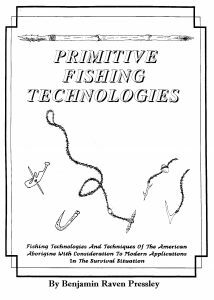 This is a comprehensive book that covers fishing spears, making a simple fishing bow an arrow, fish poisons, wiers, basket traps, making fishing line, bone hooks, springpole snares for fishing and more.